Party Palace Combo Bounce and slide. Accepts any art panel we offer at no additional fee, bright pink, lime green, purple and blue colors make this party rental inflatable pop for any event or birthday party. 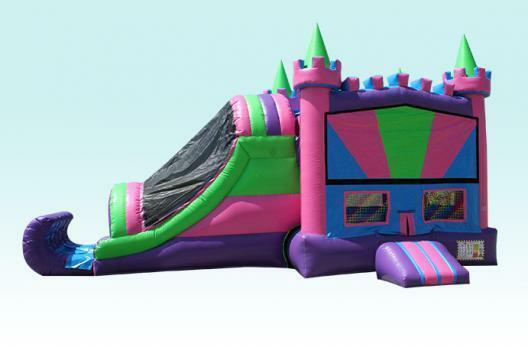 This inflatable combo bounce and slide has a bounce area, climb area, slide and basketball hoop for those high flying kids that make a birthday party special. Our repeat customers in Lakeland and Winter Haven love this unit for its colors and unique features.